Looks so yummy! I am inspired to make this! Have lots of apples in the fridge now. my ancestors must be upset with me too, I went to see a movie. 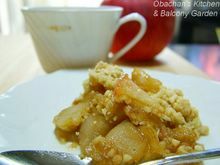 Your apple crumble looks great! 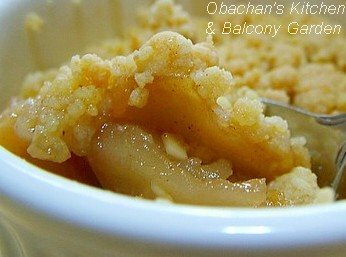 hi obachan, i can never resist a good crumble and yours looks truly delicious! Oh no! Now I have a terrible choice to make. 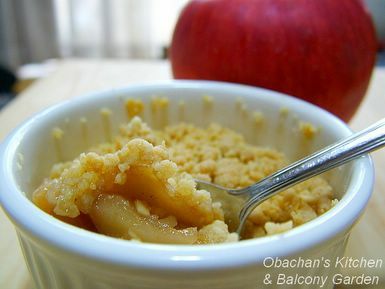 Do I use the old Fuji apples in my refrigerator for chicken salad for lunch or apple crumble for dessert? I want them both! So did you make one? Hope you enjoyed it like I did. I wish you were here, too. I still have a lot of English tea that demon gave me. 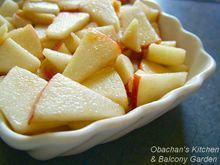 We could have a lovely tea time with this apple dessert. It's such an autumn-y dessert. I love it. Oh, I read about that movie somewhere just recently. It sounded like a real touching movie.